This chair is not only attractive and comfortable, but versatile. It works as a dining room arm-chair, but also as a small living room chair. And--best of all--it comes assembled! 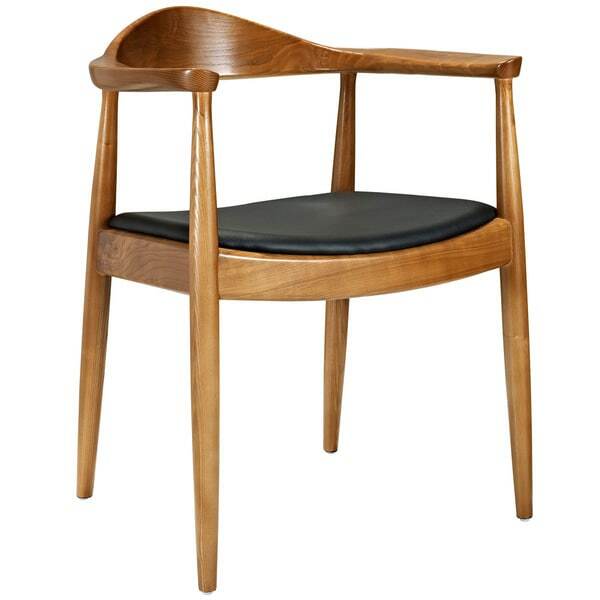 Infuse classic style into your home with this contemporary wooddining chair. Featuring a brown finish and a black vinyl seat, thishandsome chair sets the tone for casual dining with family andfriends. With its clean lines and simple construction, the chair'sunique style puts a fresh spin on a traditional design. You can relax with ease in this chair due to its comfortablewooden arms and deep seating surface. The chair has a sturdydesign, and the black vinyl seat resists wear and is easy to clean,making this a great family-friendly option for long-term use. This chair is gorgeous. I ordered them for my office, and unfortunately it didn't end up fitting my design the way I thought it would. But the chairs are real wood, and sturdy. The detail in the way the chair is built is great, and the seat cushion (albeit not real leather) is soft to the touch, and cushion-y to sit on (almost like memory foam?). They're a good size for the average office chair and person. I was REALLY sad to send these back... Worth the money if you're thinking about it! Received carefully packaged - wrapped and boxed. Chair is exceptionally well-made....cannot find anything wrong. Husband is a wood working hobbyist and agrees. Beautifully finished. Nothing about the looks of this chair says "cheap" and it's very Comfortable. I will probably change the seat cover in time but for now the vinyl looks like leather and is good. Divine Chairs! 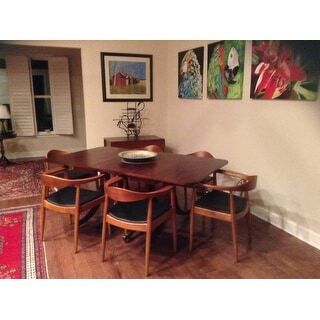 I purchased 6 Tracy Wood Dining Arm Mid-century Style Chairs that arrived within 3 days in perfect condition. They are elegant, well constructed and have transformed my living room. The quality of thee chairs is amazing and most surprising, for the price. I'd encourage others who are looking for a stylish chair, and, a comfortable one to consider purchasing these chairs! Great quality, especially for the price. Not only do they look great, but they are very comfortable. DIdn't really love the black leatherette seat, but that is an easy recover job. Wood and stain quality very high. I'm small, but there's a lot of room in these chairs for larger people to still be comfortable. After searching for quite some time, we found these chairs to match our table. They are sturdy, solid wood and on the heavier side. The only thing I'll change is the seat covering... from vinyl to a broad-weave linen. We really like the style of this mid- century redo. The upholstered seat, rather than resting ABOVE the front frame piece sits behind, placing an awkward pressure on the thighs. I think they arrived assembled. The boxes were huge. I oscillate between giving this chair 2 or 3 stars and we debated about returning it, but kept it because of the hassle. Parts of it seem to have been assembled carelessly. 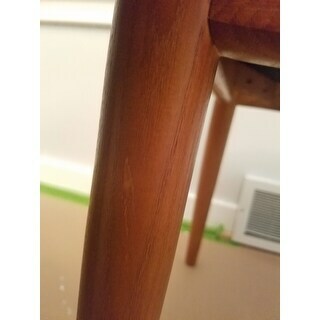 There are several places where the wood glue was splattered on the wood and then stained over which looks pretty bad. The spot in the photo is about an inch long. Both arms are scratched from where it appears to have been hammered. It looks worse in person than in the pictures. The chair has a wider than typical seat, which is nice but should be kept in mind if you are trying to pack a lot of chairs in next to each other. For our purpose (at the head of the table) it's great. The wood is a similar color to what's in the photos, maybe a *little* redder or darker. It's a comfortable dining chair and seems pretty sturdy, but only time will tell. These chairs are very nice quality. The wood is beautiful and they seem really sturdy. I will probably reupholster the black leather eventually (I don't usually decorate with black, but i liked these a lot anyway). Great value, great quality. This is a well made, surprisingly comfortable chair. If the arms fit beneath my table I would probably order another. The wood tone is lighter than I would prefer (believe the product photo on this), but is a lovely tone that would go better with teak than my walnut side chairs. I like it well enough to keep despite this discrepancy. After more thought, I decided I liked this chair so well that I have now ordered three more which I use at an auxiliary table. They also are attractive and comfortable enough that they are the ones I pull out when I need extra seating in the living room. They have worked well for us so far. They look good and are comfortable. Purchased 6 armchairs for my vintage mahagony dining table..... Love the the low, modern look....nice weight and finish...very comfortable....one chair had a tiny nick in the arm....customer service was super....it was picked up the next day and a replacement arrived in a couple days...very easy..no hassle. I love this dining chair so much because it comes already built and it’s solid and best of all it’s comfortable and has a wide seat. I have purchased these chairs for a lot of properties. the worst. I had to return these. And even tho there are plenty of good reviews (really?!) these are awful chairs. The scale is all wrong. These are huge chairs. And the finish is ORANGE. Like carrot orange. Look elsewhere. The chair is sturdy and roomy, but the color really is too orange. I'm keeping them though because they are nice. These are easy chairs to design around. The wood color has more of an orange tint than I like so I wii stain these to a richer color. On both chairs there was some damage and both boxes delivered on two different days were really torn up and partially open. Great chair!! First class quality and style. Generous sized seat. Very happy with my purchase of two of these. Beautiful chair! Fits right in with our mcm home. "Many comments refer to the Wood Color as having an “Orange Tone”. I would love to put these in My Dining Room with Medium Oak Furniture. The Style is Perfect - but will the color contrast be that obvious?" The wood finish is a medium walnut stain. "Would these chairs hold up on an outdoor patio? " 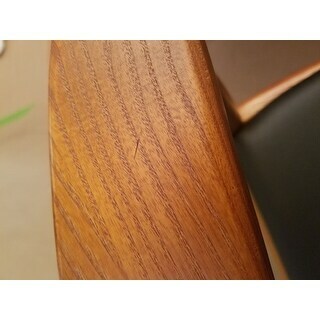 "what is weight capacity of thischair"
"Would this match a walnut stain?" It might match,it depends on the shade. "On Dec 13, 2015, you indicated that these chairs require assembly. However, at least one of the reviews here indicated the chairs were assembled. Could you clarify please?" Hello Sipea, we do apologize for the confusion, this item does not require assembly. Thank you for shopping with us. "Do these chairs arrive fully assembled from the manufacturer?" Hello happy day, this awesome item does not require assembly. Thank you for shopping with us. "Would this be close to a teak dining table color?" Hello Kinzz913, we try to represent the colors of our products accurately. Unfortunately, due to the difference in monitor colors we cannot guarantee that the color will match exactly what you see on your screen. In my opinion this is more maple. Thank you for shopping with us.